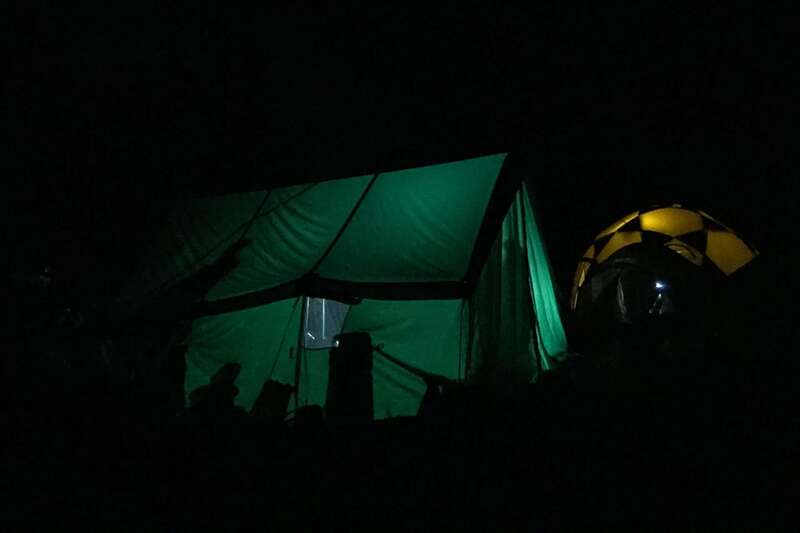 Island Peak climbing has established itself as a significant climbing destination in Nepal. 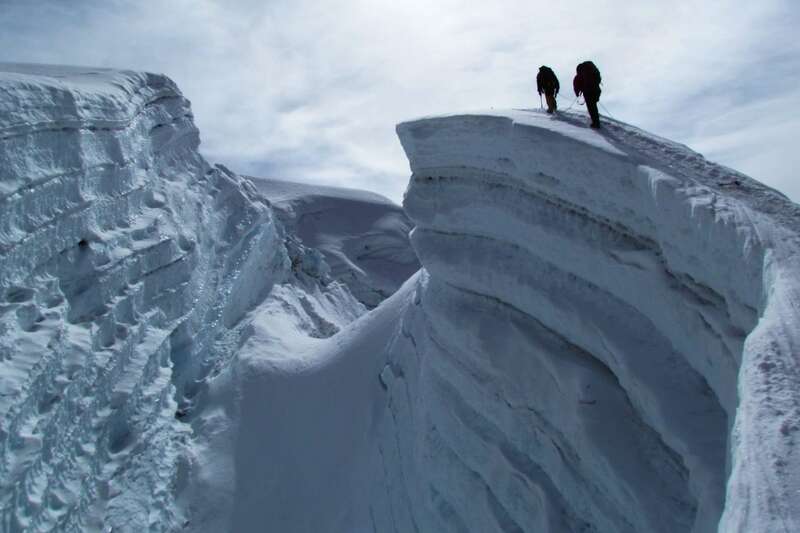 But, harsh climate conditions and chances of altitude sickness posing many problems. The whole adventure and the exquisite scenery are the rewards of this great trek across the Everest Region. 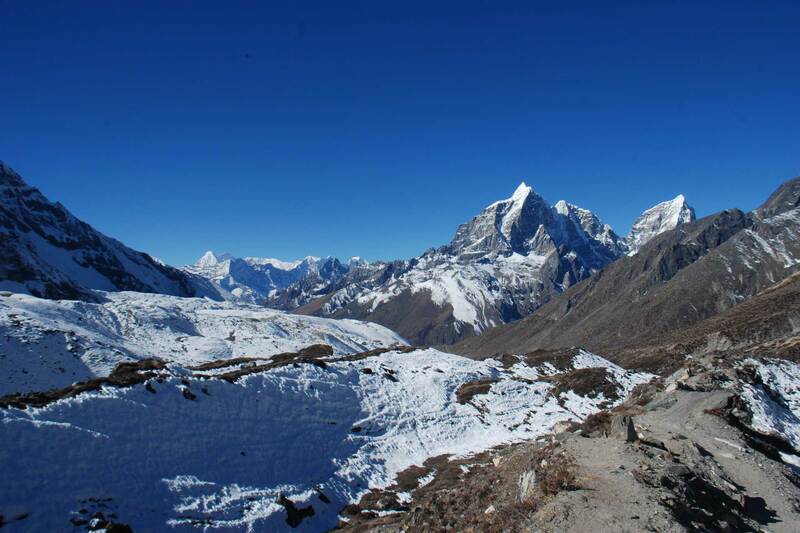 Thіѕ beautiful viewpoint stands at 6160 meters also known as Imja Tse by the Sherpa. The Island Peak climbing follows a highly adventurous route across rocky paths, terrains, villages, together with a warm welcoming of inhabitants although the views of the unique culture of the various ethnic inhabitants are living in perfect harmony. 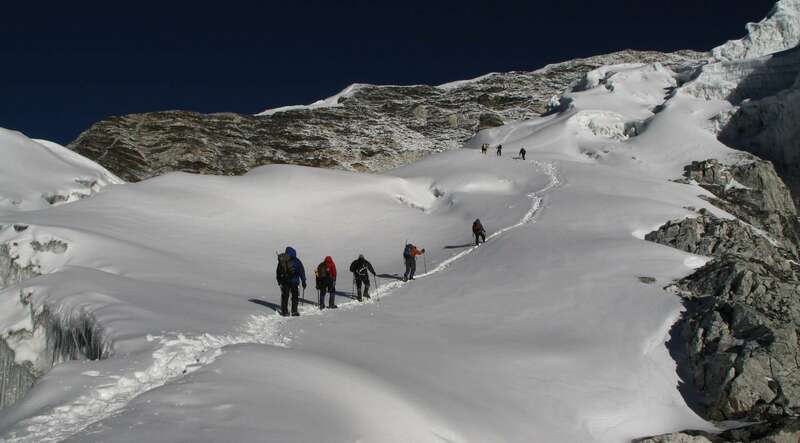 Likewise, this trek also starts from Lukla as other treks across the Everest region. Then the trail goes all the way through the charming villages, forests rich in exotic flora and fauna. A well equipped with proper lodging facilities are possible and leaving behind the route to the Everest Base Camp. The trekkers then reach Dingboche and extend into the beautiful village of Chhukung. Finally, enter Island peak base camp at 5087 meters further few hours walk from Chhukung. So, proper acclimatization after this point is mandatory as altitude sickness might pose a significant problem. The High Camp reach after a very steep climb over rocky, dangerous and adventurous paths about 100 meters further lays the summit of the Island peak. The hypnotic, and mind-boggling views of the Everest and other snow-capped mountains make it naturally rewarding while you are at the summit. The trek can carry out in all seasons but particularly more interesting during spring or autumn. It offers an insight into the way of living of ethnic inhabitants of the Everest Region because of their warm hospitality, helpful nature and impressive view make this trek a must do for thrill seekers all around the world. Day 3: Fly to Lukla and trek to Phakding (2652 m) 3h00 walk. You will be transferred to the airport in the early morning as per flight schedule. 40-minute thrilling flights to the airstrip at Lukla by plane offers a marvelous view of Central and Eastern Himalayas and as well as beautiful landscape and hills. Lukla is a gateway to the Everest Region. Day 4: Trek to Namche Bazaar. (3440 m) 6h00 walk. This is the second day of the journey. You will head to Namche after the breakfast. The trail leads you the northern valley of the Dudh Koshi River valley passing by several beautiful villages with their vibrant culture, peaceful forests and crossing over several bridges along the trail. Finally, you will get Namche. This is an exploration day in Namche. Hike till Syangboche, a small airport in the region and consider as world’s highest one. Then hike up to 3800 m to see the Mt. Everest and other popular peaks. You will have proper acclimatization. In the afternoon, you may explore the village which is more equipped with modern amenities such as internet, phone, massage and more. Day 7: Tengboche – Dingboche (4,343 m.) 5h00 walk. Today, after having our breakfast, easy descend to Debouche through the forest of Rhododendron, then an easy trail leads you Panboche after crossing the Imja River in the lap of Ama-Dablam. We will stop for lunch here then continue to walk through the open alpine hilly area to Dingboche. Day 8: Dingboche – Chhukung (4,730 m.) 3h00 walk. 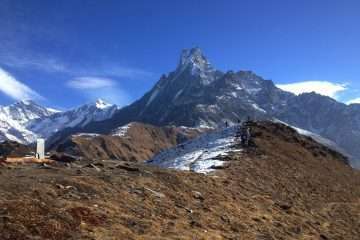 The trail leads you to open rocky hill area from Dingboche to Chhukung. 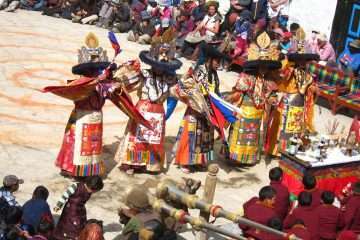 It is situated in the lap of the huge rock which bonds Nuptse and Lhotse. 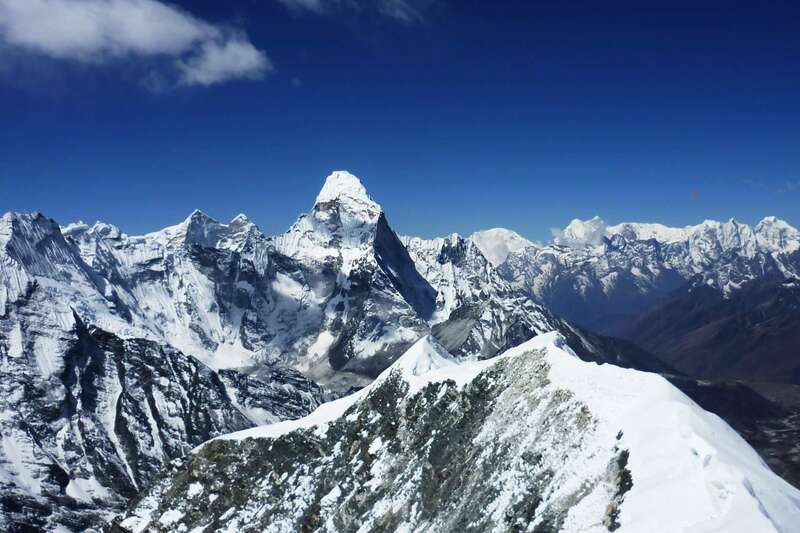 It offered beautiful scenery of Ama-Dablam and considered as a most snapped picture of this peak in Nepal. 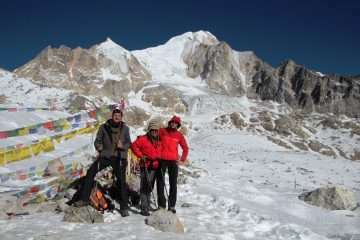 Day 9: Chhukung – Imja Tse (Island) Peak base camp (4,970 m). 4h00 walk. Today, the trail leads us to Island Peak Base Camp following by Imja River a pleasant place with a small lake and good view of Nuptse and Lhotse ridge where we set up our tent to spend a night. We get ready for all the climbing equipment for the summit. We ascend from Base Camp to reach Island Peak High Camp, a beautiful spot where we can enjoy spectacular views of the mountain in a circle. Strategically, this night is uncomfortable due to altitude and cold. Day 11: Imja Tse (Island) Peak Summit (6,160 m.) back to base camp. 5h00 walk. In the early morning, we will start our footsteps to the summit. Here is to be taken attention while climbing the icy-wall to get border which leads to the summit. After reaching the top of the peak then we come back to Island Peak Base Camp. Day 12: Security day to submit Imja Tse (Island) Peak. The day is the just spare day in case of trouble to summit due to bad weather or altitude problem. Day 13: Trek to Pangboche (3,901 m.) 6h00 walk. From Imja Tse (Island) Peak base camp, we back to Pangboche following by same way in the open alpine hilly area with magnificent views of mountains. We trek for 5 to 6 hours today. From Pangboche, we walk close to the river and arriving to cross the river the trail leads you way up to Tengboche through the forest of Rhododendron, fir, and birch. Gradually, descending to bridge over Dudh Koshi at Punki Thanka and, then climb up to Namche Bazaar. Day 15: Trek to Phakding. 6h00 walk. A steep descend to bridge over Dudh Koshi, after crossing it towards Phakding passing by the forest of Rhododendron, pines and small settlement. Day 16: Trek to Lukla. 2h30 walk. The final day of the trek, this is an easy walk to Lukla passing through the charming villages and alpine apple farms. As per the flight schedule, we catch a plane to Kathmandu from Lukla with spectacular scenery of mountains and landscapes by the airstrip. Upon arrival in Kathmandu, transfer back to the Hotel. Especially, you have a free day for the rest since the long stay in the mountain, and you can do anything as you like. You will transfer you to the airport 3 hours before your scheduled flight from the hotel for your way back to the country. The published Prices on our websites in the US$ dollars but payable in US$ and Euro and other currency. All prices published on our websites are set as low as possible. All prices may vary at any time subject to availability. But, we guarantee our prices which have already signed up for your tour. Please reach us to Make a customized price.